Today, many options exist if you are missing some or all of your teeth. Dr. Hadgis can help you make an informed decision on what will work best for your oral health and your budget. If dentures are your only option, you are in good hands with Dr. Hadgis. He will do everything in his power to make your dentures beautiful, functional and comfortable. To be fair, we must include some true statistics about dentures, and the people that wear them. Around half of the people who have upper dentures are unhappy with them. And nearly three quarters of the people with lower dentures wish they would have made a different decision. What this means, when you are a patient of Dr. Hadgis, is that he will try to find alternatives for you that have much better odds of making you happy. Dr. Hadgis’ cosmetic dentistry training means that the dentures he does place for his patients are beautiful and appropriate, and his focus on whole-body health means he will do everything he can to make sure your dentures are as comfortable as possible, which will help maintain your oral health and overall well-being. 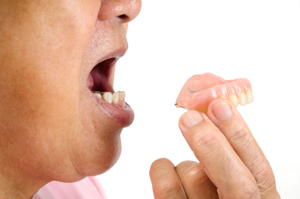 If your dentures don’t fit well, your nutrition and communication will be affected. The gravest consequence of full removal of your teeth is one that many people may not be aware of: deterioration of the jaw bone(s) at the site of the missing teeth. Over time, the bone at the site of a missing tooth is reabsorbed by the body. If ALL of your teeth are missing, your jaws will shrink. This causes a condition called facial collapse, which makes it very difficult for you to wear any kind of denture at all. Soft dentures might be an option for you if you have a shrunken jaw bone. The soft material makes them fit better than hard palate dentures, though it also deteriorates more quickly and needs to be replaced more often. The best option for you may be to go to overdentures with dental implants. The surgically implanted root forms will slow or halt the bone loss. Click here to read more about overdentures with dental implants. Dr. Hadgis will help you decide what the best option is for your individual situation. Full or Complete Dentures — When the patient is missing all of his/her upper or lower teeth, and a plate is made to replace the full set. Partial Denture — A more economical way to replace several missing teeth with one appliance. Overdentures (with Dental Implants) — The best option when used with dental implants. Most secure, helps halt bone loss in the the jaw.